His team produced a successful engine: The prototype of a stylish rotary-powered coupe called the Cosmo made its debut at the Tokyo Motor Show in 1963. Mr. Yamamoto patiently talked about the Cosmo to visitors and then drove the car across Japan with Toyo Kogyo’s president over two weeks. 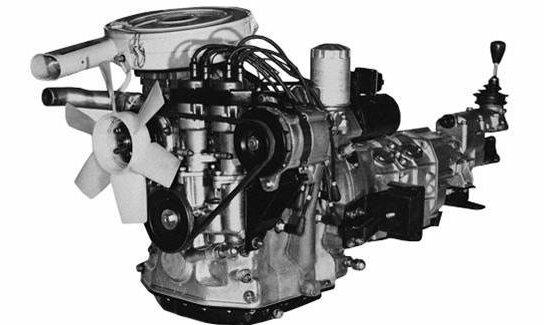 Rotary engines were mass produced and featured in the company’s sporty compacts, but they had a significant flaw: poor fuel economy, which became a liability when energy crises struck in the early 1970s. Sales dropped, and the company was close to bankruptcy. Kenichi Yamamoto championed rotary engines and eventually became president of Mazda Motor Corporation. In 1974, Mr. Yamamoto became the head of Toyo Kogyo’s project to find fuel-saving innovations; he was adamant that the company could not abandon a breakthrough technology that set it apart from its competitors. The engine overhaul worked. The engine’s fuel economy rose significantly. And sales of the rotary-powered Mazda RX-7 model soared. But while the rotary engines remained the hallmark of the company’s innovation, the fuel shocks of the 1970s led it to rely increasingly on piston-engine vehicles, like the GLC. Mr. Yamamoto was born in Japan on Sept. 16, 1922, in Kumamoto Prefecture, on the southwestern island of Kyushu, and later moved with his family to Hiroshima, where Mazda has long had its headquarters. He graduated with a mechanical engineering degree from what was then called Tokyo Imperial University (now the University of Tokyo) and served in the Japanese Navy. The detonation of the first atomic bomb by the United States over Hiroshima on Aug. 6, 1945, killed Mr. Yamamoto’s sister and destroyed the family’s home. But his parents were still alive. He returned to Hiroshima and was hired by Toyo Kogyo to work at a plant outside the city that made transmissions for its three-wheeled trucks. It was grimy work, but it allowed him to explore the engineering challenges of making transmissions. One day, he found blueprints of the transmissions “and he began to check their tolerances, acting as his own quality control,” according to the website Japanese Nostalgic Car. His diligence and inquisitiveness placed him on a path to management. A rotary engine Mr. Yamamoto and his team developed in the 1960s. As head of research and development, Mr. Yamamoto listened to a suggestion in 1978 from Bob Hall, who was then working for Autoweek magazine, that the company build an inexpensive two-seat roadster. Mr. Hall made his pitch, but the idea did not advance for three years, until he was working for Mazda as a product planner in Southern California and Mr. Yamamoto saw him on a visit there. In 1985, after Mr. Yamamoto became president, he recommended that the company’s board approve production of the car: the MX-5 Miata, which proved to be immensely popular. One of Mr. Yamamoto’s other priorities as president was to expand Mazda’s presence in the United States by building an assembly plant in Flat Rock, Mich. At the groundbreaking, in 1985, he acknowledged the difficulty of bringing a Japanese production system to the Midwest. “We recognized that the guiding principles to which we have long subscribed in operating our company will be put to a real test here at Flat Rock,” he said. The factory became a symbol of Mazda’s continuing partnership with the Ford Motor Company, which bought 50 percent of the plant in 1992, augmenting its existing 25 percent stake in Mazda. Mr. Yamamoto stepped down that year after five years as chairman. Mazda’s last mass-produced rotary-engine car was the 2012 RX-8. Information on his survivors was not immediately available. In 2003, Mr. Yamamoto reminisced about pioneering the rotary engine, which went on to power 1.8 million Mazda vehicles.